Expressing strong condemnation of the most recent ballistic missile launches carried out by the Democratic People’s Republic of Korea (DPRK), the United Nations Security Council reiterated that the country should refrain from any actions, including nuclear tests, in violation of the relevant Council resolutions, and comply fully with its obligations under those resolutions. “Such [ballistic missile] activities contribute to the DPR Korea’s development of nuclear weapons delivery systems and increase tension in the region and beyond as well as the risk of a regional arms race,” stressed the 15-member Security Council in a statement issued late yesterday. “[We regret] that the [country] is diverting resources to the pursuit of ballistic missiles while [its] citizens have great unmet needs,” the members added. Three of the ballistic missiles launched on 5 March landed in Japan’s Exclusive Economic Zone. These latest ballistic missile firing follows at least 14 launches between April last year and February this year, as well as a nuclear test in September 2016. These actions are also in violation of a number of Security Council resolutions, including one adopted in March last year that had imposed fresh sanctions on the country. Further in the statement, Security Council members underscored the importance of maintaining peace and stability on the Korean Peninsula and in north-east Asian region at large and expressed their commitment to a peaceful, diplomatic and political solution to the situation. They also welcomed efforts by Council members, as well as other States, to facilitate a peaceful and comprehensive solution through dialogue, emphasised the importance of DPR Korea showing “sincere commitment” to denuclearisation, and stressed the importance of working to reduce tensions in the Korean Peninsula and beyond. 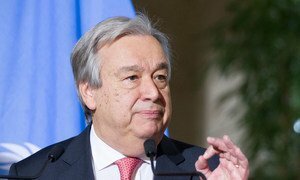 Earlier this week, UN Secretary-General António Guterres had also condemned the missile launches and reiterated his call for the DPR Korean leadership to refrain from further provocations and return to full compliance with its international obligations. United Nations Secretary-General António Guterres has condemned the reported firing of ballistic missiles today by the Democratic People’s Republic of Korea (DPRK), three of which landed in Japan’s Exclusive Economic Zone.